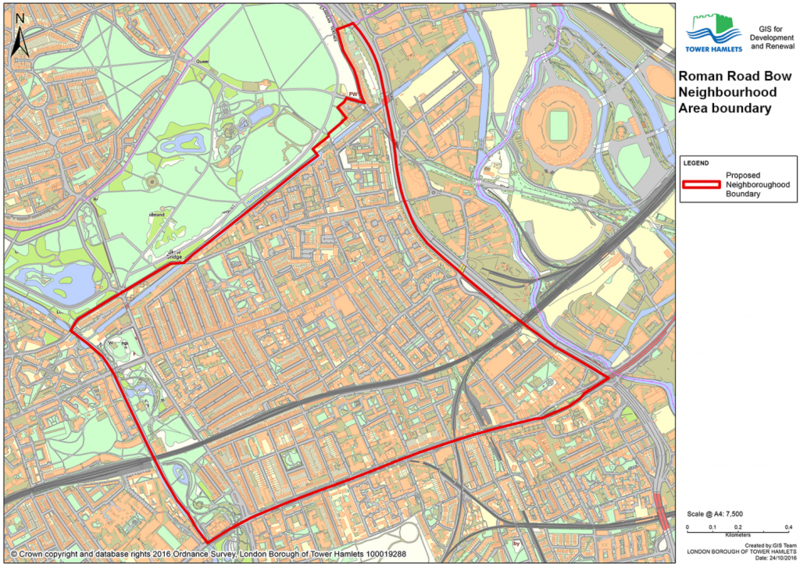 Following consultations with residents and groups around the suggested border area, the official Boundary for the Roman Road Bow Neighbourhood Area has been agreed as below. To the north, the Area extends to the boundary of Victoria Park. At the north-eastern reach, this includes a section of Cadogan Terrace that belongs to LBTH; and the buildings on St Marks Gate including the Montessori school and Growing Concerns garden centre. At the north-western reach, the Area includes Old Ford Road up to the bridge crossing the Regents Canal. To the east, the Area extends to the A12. To the south, the Area extends to the middle of the A11. It includes the buildings and pavements on the northern side of the A11, including the island on which stands St Mary’s Bow Church. It excludes the houses, tube stations and pavement on the southern side of the A11. To the west, the Area extends to the Regent’s Canal including Whitman Road, the shops under The Green Bridge on the northern side of Mile End Road (A11) only, Clinton Road, Haverfield Road, Mile End Climbing Wall, the Palm Tree and Bow Wharf. Roman Road is the high street that runs through the area uniting smaller enclaves including Old Ford and MEOTRA. The area includes the stretch of Roman Road that falls in the postcode of E3, from Parnell Road until the bridge over the Regents Canal.